This book was recommended to me by a friend and it works! This book will remove all addiction to cigarettes. You can smoke while you read it, and when you get to the last page, you are done with smoking. Also, this requires no "Will Power" to quit. You will simply not need them anymore and you will be in conrol of yourself again. You have lied to yourself for so long about your smoking habit and this book forces you to confront yourself and take control again. This book is like being able to go back to before you started smoking but with all you know now and choose to not do it. 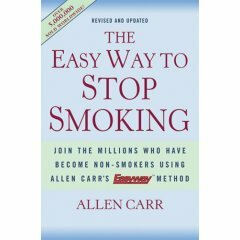 Every smoker I know would jump at that chance and this book, "The Easy Way to Quit Smoking" is exactly like that. I have no connection with this book other than I read it and as of now I haven't smoke a single cigarette for over 2 and a half years. I do not crave it, miss it, or think I will ever be "weak" and go back. I am FREE! Oh and by the way, the book costs less than 2 packs of cigarettes. AND, remember, you get to smoke the WHOLE time you read the book, and when you are done reading you don't want to smoke. There is nothing to give up because the book TURNS YOU OFF of smoking and it's NOT WILLPOWER that does it. The "EASY WAY" actually kills your addiction with your mind. It stomps out the MENTAL ADDICTION that keeps us coming back to cigarettes, and haunts us when we are trying to quit with will power. Smoking is an EASY habit to QUIT!! Don't believe Phillip Morris and all the HYPE! !